Clarity 6A High Density Jack, ETL verified to TIA Category 6a component specification. Rear-loading, 180° exit, 8 position. Quick and easy lacing cap termination. Universal T568A/B wiring label. Center tuned to Clarity 6A/10G patch cords for optimum performance. ETL Verified to Category 6a component standard: Ensures standards compliance. Center tuned 6a design: Transparent interface with Clarity 6A cords. Easy lace wiring cap reduces wiring time. 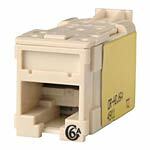 Icon compatible, C6A marking on jack face: Supports 606 designation requirements.